The first real leather balls designed specifically for pitching machines, JUGS Pearl Pitching Machine Balls are simply the longest lasting real seam leather pitching machine balls made. The patented NeverBreak seams are guaranteed to stay intact for one year - something a real hardball would never be able to do under the pressure exerted by pitching machine wheels! The official size and weight of a regulation baseball, JUGS Pearl baseballs can be used as game balls, too. They feature a full grain leather cover, cushioned cork center and wool winding - just like a real baseball. Far more durable, though, they last five times longer than any brand of baseball when used with a pitching machine. 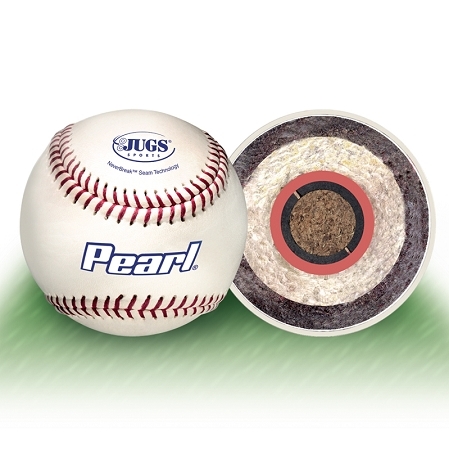 These JUGS Pearl Pitching Machine Baseballs feature a one year manufacturer's warranty and, although they are manufactured specifically for JUGS pitching machines, they will work in any pitching machine that throws real balls. Purchase them with a Pitching Machine, and they ship for free! Buy them in bulk (4 dozen) and you'll not only get a better per ball price, but you'll get a bucket and lid, too! PLEASE NOTE: There is a coating on JUGS Pearl leather balls, which is one of the reasons they last longer than real baseballs. Because of that, some pitching machines - the Rawlings/Spinball Sports, BATA and Heater pitching machines, in particular - are not quite as accurate with these balls when they are brand new. After they get dirty and/or scuffed up a bit, they are more accurate. JUGS Pearl Leather pitching machine baseballs feature a 1 year manufacturer's warranty against damage caused through normal use. 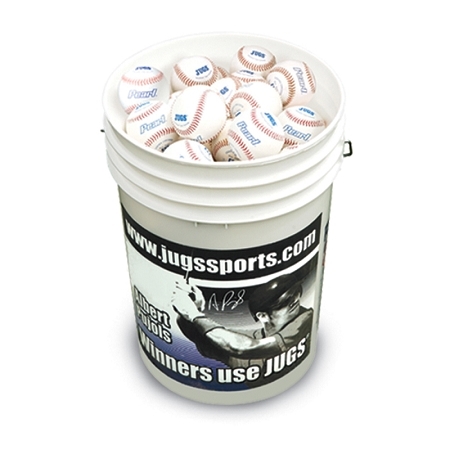 JUGS Sports will replace your baseballs, free of charge F.O.B. to its factory in Tualatin, Oregon; provided, however, that upon request, the Buyer shall return the allegedly defective balls to the Company s factory with transportation charges thereon prepaid. 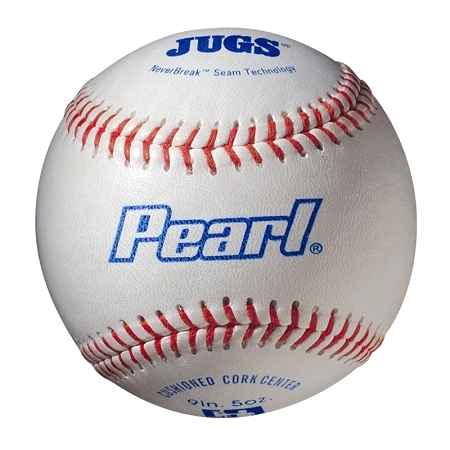 No matter where you order JUGS Pearl Leather Baseballs from, NOBODY actually stocks them; they all ship directly from the manufacturer's warehouse located in Tualatin, Oregon. Therefore, the shipping time frame is exactly the same no matter what website you order from (we hope that it is this one!). JUGS Pearl baseballs typically take 2-4 business days to ship from the time you place your order. They ship via Federal Express (FedEx) Ground and could take anywhere from a day or two to a week to get to you AFTER being shipped, depending on your proximity to their warehouse. We will notify you of your tracking number the moment we receive it from the manufacturer's warehouse.